So glad you came back for more information on how to stretch your way to relief of those tight, sore calf muscles! 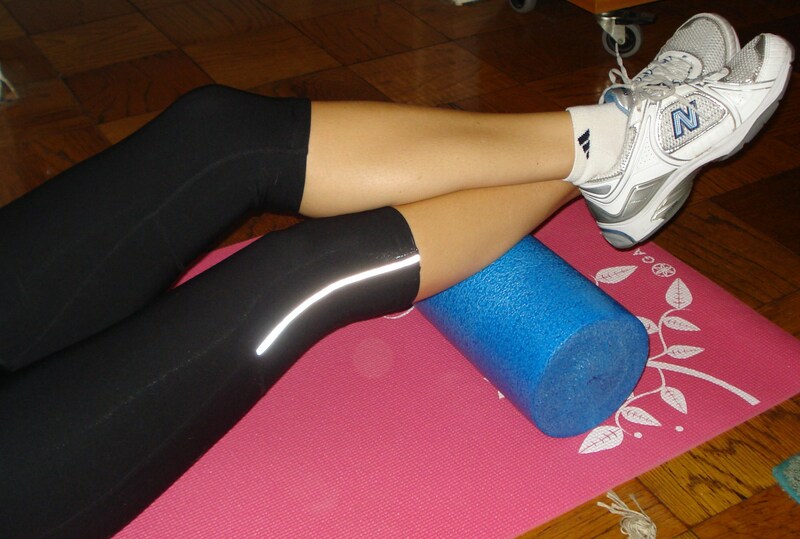 I start by coming clean about what I call my “love-hate relationship” with the foam roller. My friend and former personal trainer, Rich, introduced me to the foam roller years ago, but I have to admit I stopped using it for quite some time. Now, I truly wish I stuck with it. Just how does the foam roller fit in to flexibility training? It is an integral tool used in a stretching technique called self-myofascial release, often shortened to SMR. The idea is that by applying pressure to a muscle adhesion, commonly referred to as a “knot,” you initiate a process called autogenic inhibition. My NASM textbook defines autogenic inhibition as:”the process when neural impulses sensing tension are greater than the impulses causing muscle contraction. Stimulation of the Golgi tendon organ overrides the muscle spindle.” In simple terms, you use the foam roller to apply pressure to the most tender spot in your tight calf muscles and you will eventually feel the knot “release” itself. Repeat the same process for the left leg. The jury seems to be out on whether you should do SMR before or after you workout. Personally, it helps me to perform SMR on my calves both before and after my workout, as my goal is to perform exercises like squats and lunges as optimally as possible. If time is an issue, I’d say make sure at a minimum you add the foam roller a part to your cool down. Self-myofascial release can help with more than just your tight calves. Be sure to check back for more foam roller stretches that can help you have fun, be fit and be fabulous! Posted on November 9, 2011, in Fitness, Health and tagged Autogenic Inhibition, Foam Roller Exercises for Calves, Laura DeAngelis, Self-Myofascial Release. Bookmark the permalink. 2 Comments. Is it true that using a foam roller on your calves can also prevent knee- cracking when squating and doing other stretches and movements with your lower boddy? Is it safe to use a foam roller to crack your mid-lower back?